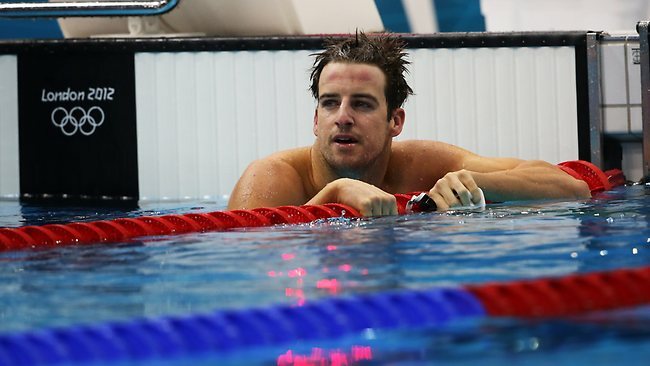 James Magnussen went some way to exorcising the failure of Australia's Freestyle Relay team to get an Olympic medal as he produced a solid 100m heat performance. The world 100m Freestyle champion, known as 'the Missile', is a hot favourite to add the Olympic title to the world gold he secured last year in Shanghai and has clocked 47.10 already this year. He qualified fourth overall in 48.38, with USA swimmer Nathan Adrian fastest in 48.19. Magnussen said: 'I think it was a step in the right direction, it was a good swim. 'It's an improvement from the other night, I am keeping positive with a smile on my face. 'I took a fair hit in the relay, I am still trying to bounce back from it. It was one of my first failures since breaking into the international scene. Daniel Gyurta headed the 200m Breaststroke heats, while the USA qualified fastest for tonight's 4 x 200m Relay final in 7:06.75. There was a shock in the women's 200m Butterfly, where Great Britain's world silver medallist Ellen Gandy finished 17th, with USA swimmer Kathleen Hersey leading the way in 2:06.41.